Nationalist Party leader Adrian Delia on Sunday said any party supporters thinking of withholding their vote were playing into the hands of the Labour Party. Speaking during a political gathering at the PN club in Birkirkara, Dr Delia said the elections for the European Parliament and local councils in May were fast approaching. 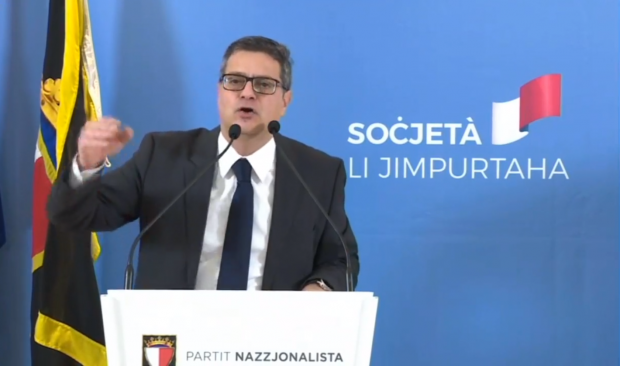 “Any of you who are thinking of staying home, who may be thinking that this is a wise thing to do, will be voting for Joseph Muscat, you will be giving consent to [Tourism Minister] Konrad Mizzi,” he said. Although it was clear that the road ahead for the PN was tough, and the party had to make up a lot of lost ground, it had the courage of its convictions, he stressed. Dr Delia said the PN was facing an electoral opponent in the PL which had no qualms with engaging in character assassination and trying desperately to split the Opposition apart. Dr Delia said the media had spent weeks talking about him, but it was now time for them to start focusing instead on the corruption scandals rocking the country – among them that involving the privatisation of three state hospitals. According to media reports Vitals Global Healthcare funded a €5 million takeover of a local medical firm called Technoline, which was then given exclusive rights to handle procurement for the three State-owned hospitals entrusted to VGH. VGH then reportedly sold the three public hospitals it managed to Steward Healthcare for just €1 in 2017, but “millions” changed hands behind closed doors. These payments included a €1 million payoff to a Dubai company called Mount Everest General Trading LLC, whose involvement in the ownership structures was previously unknown. The government has repeatedly refused to release documents related to the due diligence carried out on VGH and its owners. It paid the concessionaires around €70 million annually to make use of bed space and medical services provided by the company at the three hospitals. A memorandum of understanding between the government and some of the investors behind VGH was signed six months before Projects Malta, which falls under Tourism Minister Konrad Mizzi’s control, issued a request for proposals for the running of the three hospitals in April 2015. Health Minister Chris Fearne last week said he was not involved in the talks between the two companies, and the deal was being investigated by the National Audit Office. Dr Delia on Sunday challenged Prime Minister Joseph Muscat to decide whose side he was on, Dr Mizzi’s or Mr Fearne’s? Corruption, he said, meant the government was robbing ordinary citizens. “Those of you at home, who have to work hard, that have to take risks, and sacrifice, these are the ones who suffer. The PN is talking about these people when it talks about corruption,” he said. Dr Delia said he knew for certain that there were a number of Cabinet ministers who were not comfortable with the corruption allegations facing the government. “They know this is not right, the responsibility is on them to take steps, to truly represent the people who elected them,” he said. The same, he said, was true of the corrupt land deal in St George’s Bay. The Corinthia Group will be paying the government just €17 million to build up to 100,000 square metres of residential and office property in St George’s Bay. The €17 million premium – on a piece of land which according to real estate agents carries a current market price tag of at least €700 million – is to be paid in several instalments over a long number of years. The PN leader said this was what he and his party were fighting for: social justice. “For those struggling. For those left behind just because they do not share the government’s politics. For those who do not have a level playing field – these are the people we are fighting for, and we won’t give up,” he said. Earlier, Opposition MP Edwin Vassallo told those gathered to stick together. Those who were not onboard with the party’s agenda, were acting against the party. And those who were not acting in favour of the party should know that they were no friend of the PN. Anyone who hit out against a single member of the PN, he said, was hitting out against the entire party. “Whoever hurts David [Casa], hurts me. And who hurts Peter [Agius], hurts me. And whoever hurts Ryan [Callus], hurts me,” Mr Vassallo said, pointing to PN members who filled the front rows of the gathering.